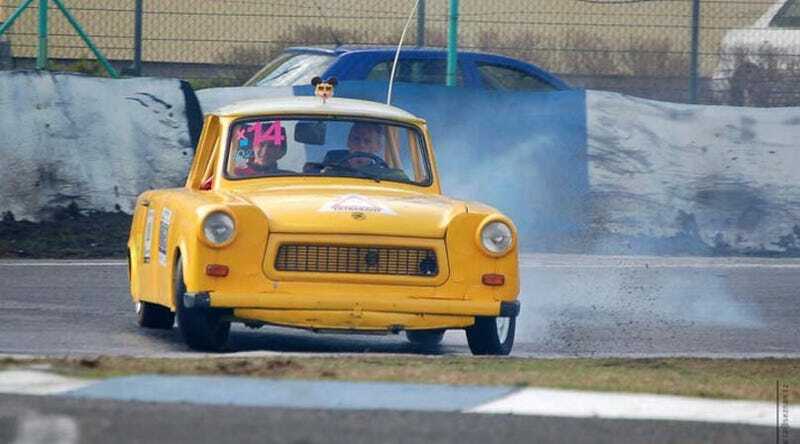 Crazy Czechs Build Tatra V8-Powered Trabant Drift Car, Will Sell It To You! Since I've been helping BobAsh obtain American cars to ship to the Czech Republic, he's helping me find a nice Hell Project I can bring over here. Here's a car I seriously considered buying- it's priced at the equivalent of $1,500- but then I realized that the California DMV would most likely have me clapped in irons the moment I attempted to register a Trabant with a backyard-built chassis, Tatra V8, and what appears to be five foot pedals. Still, imagine having this thing as your track car! Make the jump for all the photos and more Tatrabant madness. Now, to really understand this fine automobile, you have to watch a bit of Rodeocross racing. Rodeocross appears to be what Czech rednecks do when they mix beer, a dirt road course, beer, Warsaw Pact cars, beer, and beer. The Tatrabant was originally built for Rodeocross, but the organizers wouldn't let it race… because it was "too dangerous." Yesssss!